Home » Academics » Schools » Greehey School of Business » Faculty » Tanuja Singh, D.B.A. 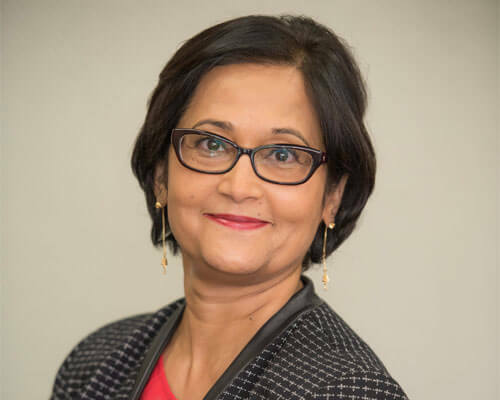 Tanuja Singh is Dean of the Greehey School of Business at St. Mary’s University in San Antonio, Texas. She joined St. Mary’s in 2009 prior to which she was Chair and Professor in the Department of Marketing in the College of Business at Northern Illinois University in DeKalb, Ill. She earned her doctorate in Marketing with an emphasis in international business from Southern Illinois University in Carbondale, Illinois. In addition to a doctorate, she also has an M.B.A. from Millsaps College in Jackson, Miss, and a Master of Science in Physics from Allahabad University in India. As Dean of the Greehey School of Business, Singh leads about 40 faculty and staff members and oversees a significant endowment for the Greehey School of Business where she helped establish the Najim Center for Innovation and Corporate Social Responsibility. Under her leadership, the school has developed new degree programs, completely re-engineered the MBA program, developed and implemented an executive education program, increased endowment, enhanced student outcomes, placement and internships, and increased the international footprint of the school. She has helped create new international alliances with universities in Germany, South Korea, France, India, the Magellan Exchange and Network of International Business Schools (NIBS), and developed new collaborative programs with the University of Bordeaux (France) and Dongyang University (South Korea). Singh regularly presents to national audiences including corporate leadership teams on various topics including: millennials’ attitudes and behaviors, global and cross-cultural strategy, women in leadership, and organizational strategy and leadership. Singh is an award winning educator whose research and consulting areas include analyzing business and consumer trends especially as they relate to digital media, millennials’ attitudes and behaviors, and global and cross-cultural strategy. She has published more than 40 peer-reviewed journal articles and conference proceedings. She is the co-author of a book on electronic media titled Surfing the Rift: An Executive’s Guide to the Post Web 2.0 World. Singh serves on the editorial boards of three marketing journals and has been program and track chair for major conferences around the world. She has received several grants from private and public sector organizations for research and training in the areas of technology and global marketing strategy. Singh is the past President of the Southwest Business Deans Association and immediate past President of Women Administrators in Management Education for AACSB International, the world’s largest and most prestigious business education network that accredits business schools, provides thought leadership and connects students, academia, and industry to advance business education worldwide. She serves as “global facilitator” for AACSB and has served as the team leader on international accreditation teams for the AACSB. She is the co-lead in the AACSB New Deans’ Seminar. She received the Leadership Award by the Hispanic Chamber of Commerce in 2015 and was inducted into the San Antonio Women’s Hall of Fame in March 2017. Singh has worked in the area of International Banking specializing in export-import trade. A passionate globalization advocate, she helped develop executive education and training programs for executives in China and Egypt, trained cooperative bank executives in India and supported numerous globalization initiatives. She has traveled extensively and maintains an active network of colleagues and friends around the world. She is the primary benefactor and honorary Chairperson for a rural school in India which especially focuses on educating and empowering disadvantaged and low income women and girls; under her guidance the school has grown in enrollment and outcomes with a more than 90% High School graduation rate. Locally, she serves on the Boards of the World Affairs Council of San Antonio and KLRN—the public television station in San Antonio. She previously served on the board of the Children’s Shelter of San Antonio.